Liferoot is a fantastic herb to farm, although its value is usually very volatile ranging anywhere from 50 silver to 3 gold per herb or 10 gold to 60 gold per stack. I highly recommend you visit your auction house or The Undermine Journal to check the price of this herb before you go and farm it. It sells best in stacks of 5 and 20 but will not sell very fast since there isn’t a huge demand for it so don’t farm too much of it. You need to have level 150 Herbalism or higher before you can farm Liferoot and you will want to be at least level 35 or 36. Update: You can make a lot of gold with Liferoot, but if you want to step it up and make thousands of gold you should read my personal favorite guide. 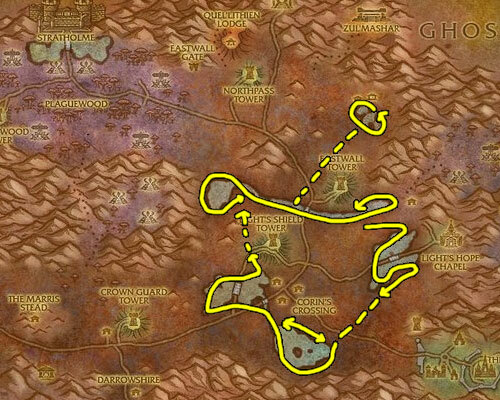 Without a doubt, the best place to farm Liferoot is in Western Plaguelands. This stuff spawns fast and close together around the water near Scholomance. 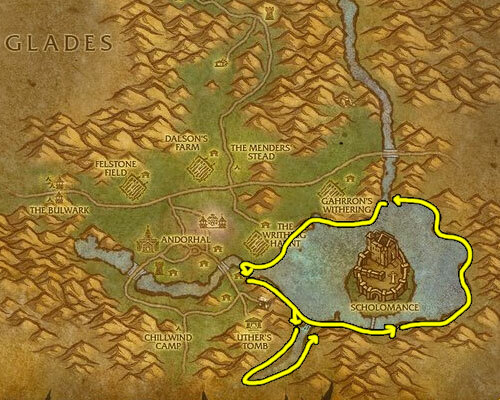 If you have a ground mount or even if you’re on foot you can run a circle around the lake, right along the shore, and collect about a dozen per loop. The problem with this farming route is that it will get very boring very fast.